Before we begin, I found a site called Sharetabs from Larry through his Twittering and thought it might be a nice way to send you off to the various blogs of contributors this week. 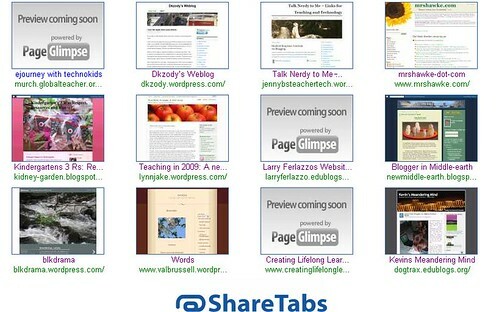 Sharetabs allows you to collect websites and then open them all as tabs or link them from small windows. So, click on this screenshot (or this link) to head to the Sharetab for Day in a Sentence contributors from this week. Lucky to be in Kuala Lumpur for the Innovative Teachers Conference, I was placed in a group with a teacher from Malaysia, Indonesia, Thailand and Korea, where English was not strong, yet we completed together a student lesson plan on indigenous shelters, with fun, endeavour, confusion but determination. — Anne M.
The last week with my students has been lovely, but I wish the adults would behave! — Karen H.
Summer is coming, but there is still much to do, so I seek a new sense of balance in my daily life. — Lynn J. How in the world will I pull off a claymation project about tolerance in the few crazy weeks that remain in the school year? Thank you so much, Kevin, for setting this up. I am going to spend some time after school is out visiting all those blogs. Such an interesting, diverse group of writers you get here. Good luck with those last couple of weeks. Thanks for collecting the sentences. I love this new tool and the cool group of course!